I think it's fair to say that most of us are not good wait-ers. We're oh-so-prone to impatience, tapping jittery fingers on jam-packed shopping carts as we cool our heels in understaffed checkout lines. We drum on padded steering wheels at red lights that seem unwilling to make that switch to green. Or bide our time in some kind of outer office holding tank listening for our name to be called as we perch in uncomfortable seats. Our blood pressure slowly ratchets up as aggravation creases our faces. We mumble and grumble to ourselves ... or to whoever happens to be unfortunate enough to be nearby. When we're right in the middle of a major crossroads, the waiting room can be an uneasy place to dwell as we spend our days with an eye out for phone calls, paperwork, emails ... all those responses, appointments, and decisions that are out of our control. We do like to be in control, don't we. As the man and I have been in the midst of this great big house selling / moving transition, I've needed to purposefully re-claim a few light-hearted responses to put to good use in the waiting room. Because I haven't been at all interested in heading down that slippery slope that leads straight to freaking out. 1. Breathing ~ Stress leads to shallow breathing which only leads to more stress. It's a vicious cycle. So breathe with me, will ya'? This simple little exercise lends itself to relaxation. It works. 2. 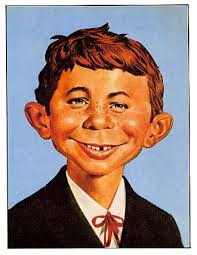 Smiling ~ Not necessarily big toothy grins like our friend Alfred E. Neuman's here, but just a gentle upturn of the lips that keeps me from taking myself and my circumstances far too seriously. Doing this reminds me that all will be well. Muse on the beauty of this with me. 3. Singing ~ Nothing formal or planned, mind you. Just a simple launching into songs of thanksgiving or trust at the drop of a hat. A few lines of an old childhood hymn lifts me straight up to the One who calms the storm. I can't help but think He smiles as He hears a slightly off-key melody intertwined with my grateful heart. 4. Walking ~ Once I hit the pavement, I truly enjoy finding that comfortable stride, feeling those muscles stretch, pushing myself to go just a bit further than last time. It's getting out the door that's the challenge. But it sure beats the alternatives, which often include mindless grazing in the kitchen and too much time wandering around online. 5. Journaling ~ To stay sane, we have no choice but to unpack all that swirls and twirls in our heads. Our family and friends get weary of our endless moaning and groaning, yet the need to process is strong and sure. I know no better way to offload all that pulls at me than sitting still with God, sharing my heart just as it is, and releasing my very real emotions and concerns to the One who already knows what's going on in the craziness. Here's a peak at some of my musings. What stress busters come to your aid in the waiting room? Such great stress-busters. I'm especially a fan of the singing one. I remember someone telling me once that if I'm ever in a bad mood, I should stand in front of a mirror and sing at the top of my lungs. Never fails to make me laugh and lift my spirits a bit! Have a great weekend! The mirror would do it, that's for sure! And how cool that we were literally chatting on each other's blogs at the very same moment. Have the loveliest weekend, Lauren! Wise words, Chris ... we don't ever wait alone because God promises not to leave us. Oh what very good company ... and what peace comes to those who accept His gracious invitations! Hi Linda, I couldn't find my comment on your previous post. I think I got spammed please check it out. I like destress activities. My favourite is walking and may be laying down and do nothing. Helps to pray for others when my thoughts are worry filled. God bless you and do have a fantastic weekend. Bummer! Sorry, I looked around and couldn't find your always words on the last post. I'd love to hear your thoughts on house church in your country! But I do agree that sometimes just taking a nap can do the trick when it comes to de-stressing. Or maybe my all-time favorite, a bubble bath. All on your list are some of my very favorite things to do. I also love to sit alone in the early morning. I hear you! Sitting alone in the early morning fills me with peace ... and fortifies me to be present with others as the day moves ahead. Thanks for coming back to join us again ... I am glad you're here! Singing in the post office! Now wouldn't that be a treat! My little melodies are offered in private, thankfully! I had a dance party this morning so I could calm down. I know one day I will miss these years with the kids, but sometimes I want to fast forward to that day. Better now though! A dance party to calm down! Now there's an idea! This is just wonderful. And I hate to admit it but it would serve me well to work on that smiling more. I realized it recently in a meeting when someone looked my way, and I was in a place I didn't really want to be, and they said, "Smile, Beth." Geez. Would that be too hard? I like the idea of singing too! Great list of tips, as always. And we have SO MUCH to be grateful for, even on those not-so-good days. Maybe we'll sing together sometime, huh? Good choices and I highly recommend them all. We are in a tense time--and I always find it is a good thing to step back and take a deep breath--before moving forward. Praying as you continue down this road of relocation, Friend! You're so right, Lulu ... these days are tense for a variety of reasons. Some pain is quite personal, some heartache because the 'days are evil.' And in those cases, light-hearted is absolutely inappropriate and downright cruel or insensitive. But in those situations where it's about our own self-absorption and self-interest, it's good to, like you said, step back and take a breath so we can move forward well. I'm actually pretty good at waiting; in a previous career I might have to wait for several days, unmoving, in a landfill, for an "appointment" that might never happen...while remaining alert to my surroundings, and to the need for concealment, throughout. Being impatient, I would have gone mad. The technique I used was just living in each moment, and it's very hard to explain, It's a bit like centering prayer, directed outward...that's about the best I can do. But that's what I've come to expect from you. 'Cause you can't sit unmoving in a landfill for days on end waiting for an 'appointment' without it impacting you somewhere deep. Sorry my presence has been irregular - it's becoming kind of a hard fight, and I'm not always up to typing. Having my head bang down onto the keyboard isn't all that much fun, and messes with the keys. And my head ends up looking like a waffle iron. I hope you and Barbara have some serendipitous moments here and there this weekend. Yeah, the waiting room comes in all shapes and sizes, doesn't it, June. The hallway. Yep, I'll remember that! My Grandmother always said that worrying gives you wrinkles - I'm sure that's why she always had a smile on her face. That place of limbo is a minefield of doubt and worry, I know, I'm there. In it, I find myself singing the phrases "I need Thee every hour" or "There's a sweet, sweet spirit in this place" or "Amazing Grace how sweet the sound" over and over. I love walking myself. It's the most favorite time of my day. Just one foot in front of the other, and just keep on going. It lets my brain just float in the freedom! I'm really happy that you are finding such great ways to keep your sanity in a time that just seems to want to rob it. You will overcome! And it will be amazing. I just know it. Weekend blessings, and 'walk on'!! I was beginning to wonder if ANYONE was going to remember those decadent days of MAD magazine! It had to be you!!! I'm happy to hear that your healing has progressed to the point where you can walk and enjoy it. I hear what you're saying about your brain floating in the freedom. It's the best therapy ever, isn't it? Maybe someday we'll meet in the middle of the USA and take a bit of a hike together! You are a spirit lifter, girl. I'm so glad you're in my life! These five strategies are applicable to SO many areas of our lives. I too often fall into the trap of waiting--wondering--worrying. But I know it's possible to break free. Thank you for being a light of hope, Linda! It can be a slippery slope if we don't ask God to help make us aware before we begin to slide downwards to those crazymaking reactions! I love what you wrote about breaking free. He helps us go there. And with you, I'm grateful! 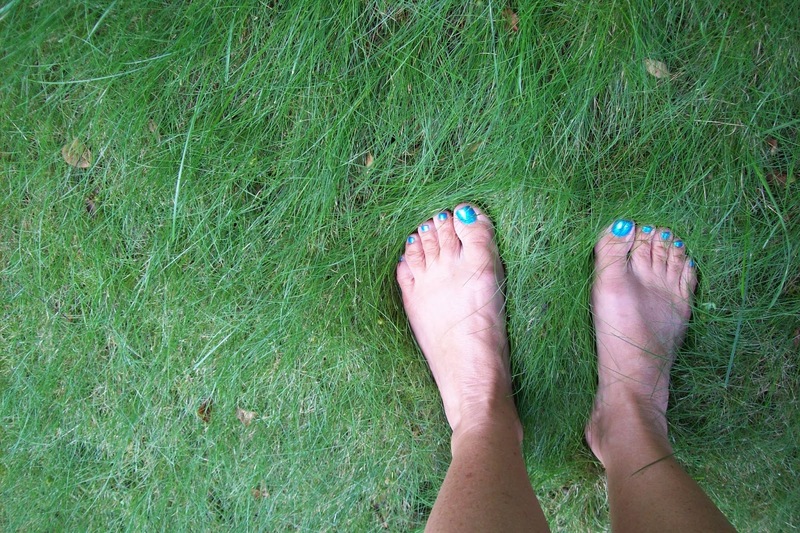 I'm grateful for these 5 practical tips, Linda, because they are true and so stress-reducing! I need to do number 2 and 5 much more. I've never been a big smiler because I was so self-conscious about my slightly crooked teeth--especially when I was in my teens. But lately I've been trying to smile more because I know that it not only makes me feel better, but it puts others as ease as well. Besides I have a terrible "resting-face" expression. It only gets worse as I get older! Ugh! And walking is so therapeutic for me. I'm back to my usual work-out routine post-vacation that includes walking on a treadmill, but I want to get outside and walk around more too. Thanks for these incredible reminders, my friend! I hope all is going well with the transition! You have my prayers and cyber hugs! Dear Beth ~ I hear you about the smile as my teeth grow more crooked by the year. And not that I want to check out the mirror at this point, but I think it's fair to say that my 'resting-face' position is not exactly stunning either! I guess if these are the worst things that happen this year, we'll both be very thankful, yes?! You, my friend, have a gorgeous, warm smile. It might be 13 months since I've seen you, but I remember your grace and kindness well! So ... when are you coming back east? Well, all the ideas you mentioned pretty much sum up what I choose too. I love walking - one of my favorite things to do to get in some quality God moments. I have also found that reading can help and intentional time with friends or family. Hang in there girl! What is your drop dead date for moving??? Soon?? The move is coming up soon, Mary ... more on that coming! I came upon that unforgettable face from a past long ago and had to smile, PLUS come check out why you showed him! Even looking at pictures that make me smile such as a baby or a child doing something cute or me in Daddy's arms...all those calm my anxiousness. I would say that journaling is my best way, and I have been using colored pencils to "pray in color" which really relaxes me. I always loved Alfred's 'What, Me Worry?' mantra! I'm glad he led you here, Linda! I love that you use colored pencils in your jounaling ... I have a mug of colored pens that I keep by my bed, and as I reach for my journal, I close my eyes and choose a random color to write that day's musings. I'm glad we connected today, thanks to Alfred! Walking and journaling are stress relievers for me too. And sometimes I just have to step away - collect my thoughts by myself - and then return to the situation. :) Thanks for sharing this. I'm glad I linked up next to you at Emily's. I hear you, Kristin. I'm big on stepping away, too. Those chunks of silence revive my soul so that I can jump right back into what's going on around me and maybe have something to offer. I'm with you on this ... and I'm glad to be next door neighbors today. Got a cup of sugar? These are all great stress busters. It's along the lines of smiling, but I use a funny book or movie to help ease my stress sometimes. I love a great movie! Netflix ... yes! It takes so little energy to lift the corners of those lips up, yes? Thanks for taking the time to leave encouraging words, Angela. And yes, it made me smile! Linda, I love your list--all five. Another thing I find helpful, especially when I find myself dictating to God how to solve all my problems, is to pray "not my will, but yours be done" over and over until both the anxiety AND my self-made plans fall by the wayside. :-) And now, before I move on to something else, I really do need to put a smile on my face! Talk about a reason to smile, huh? You're oh-so-perceptive, Valerie! I never even saw the W's! Stressed maybe? Self-care is of the utmost importance during times of transition. So glad you're prioritizing it right now! Transitioning with you, friend. Transitioning with you! I have had to do a lot of 'waiting' in a very literal sense over the past 24 hours - 6 hours in the ER waiting room last night, and then back the next day waiting for results. How true that waiting can often lead to worrying and other unhealthy outcomes. I love your suggestions for how to make the best of our times of waiting. incrementalhealing.wordpress.com - sharing my story of healing from childhood abuse - I'd love to see you there! Oh Kamea ~ There's nothing like any kind of time in a hospital to ratchet up our stress, our worry, our fear. I hope you found some comfort here today. And I pray that your results came back with words that brought you relief. Thanks for taking the time to introduce yourself even in the midst of the craziness ... yes, I will be by to visit your site. It's so true how waiting has a way of morphing itself right on into sheer panic if we let it. Our minds are free to wander away from God, and away from God is where fear lives and breathes. So glad to be visiting you here today from the Thought Provoking Thursday Linkup. Thanks for coming by, Brenda! Your words have encouraged me today ... I am so appreciative!